Indian Exchange Coinsecure Hit By $3.5 Million Bitcoin TheftsteemCreated with Sketch. Coinsecure, one of the leading cryptocurrency exchanges in India, has reported a theft of 438 bitcoin, approximately worth $3.5 million, from the company’s bitcoin wallet. The company suspects an inside job. 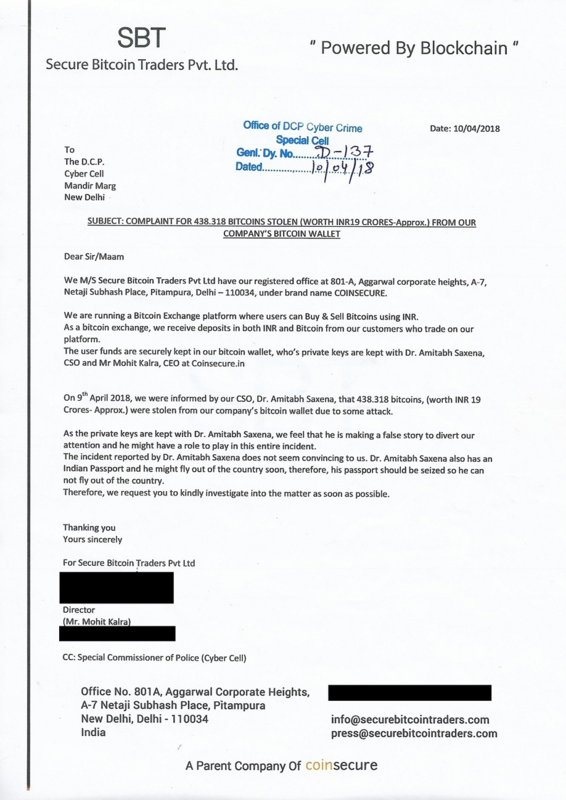 In a written complaint to the Cyber Cell of the Delhi Police Coinsecure mentions the possible involvement of the company’s CSO, Dr. Amitabh Saxena. The complaint reads, “The user funds are securely kept in our bitcoin wallet, whose private keys are kept with Dr. Amitabh Saxena CSO and Mr. Mohit Kalra, CEO at Coinsecure.in. On 9th April 2018, we were informed by our CSO, Dr. Amitabh Saxena, that 438.318 bitcoins were stolen from the company’s bitcoin wallet due to some attack. As private keys are kept with Dr. Amitabh Saxena, we feel that he is making a false story to divert our attention and he might have a role to play in this entire incident.” Coinsecure requested the seizure of Dr. Saxena’s passport. When dealing with cryptocurrencies, a user is usually given a public address and a private key to send and receive coins or tokens. The public address is where the funds are deposited and received. But even though a user has tokens deposited into his or her address, he or she won’t be able to withdraw them without the unique private key. A private key is a sophisticated form of cryptography that allows a user to access one’s cryptocurrency. A private key is an integral aspect of bitcoin and altcoins, and its security make up helps to protect a user from theft and unauthorized access to funds. The exchange has posted a note on its website on April 12, 2018 informing its users about the incident. It reads, “We regret to inform you that our Bitcoin funds have been exposed and seem to have been siphoned out to an address that is outside our control.” The Coinsecure theft is one of the biggest cryptocurrency thefts in India. A case has been registered under IPC sections and Section 66 of the IT Act. Delhi-based Coinsecure, founded by Mohit Kalra and Benson Samuel in mid-2014, launched its Bitcoin exchange on January 1, 2015, and has seen a fast-paced increase in the volume. The incident comes a week after the Reserve Bank of India issued strong regulation. In view of the issues such as money laundering, the Reserve Bank of India has directed entities (such as banks and payment gateways) regulated by the RBI to stop dealing with or providing any services to individuals or businesses indulging with virtual currencies in any form. It further said that regulated entities which already provide such services shall exit the relationship within a specified time.” It is estimated that in India, around 5 million people have invested a totalof approximately $2 billion in crytopcurrencies..